1958-1/75 discontinued Toyota front mount. SOR offers three Motor Mount component kits. 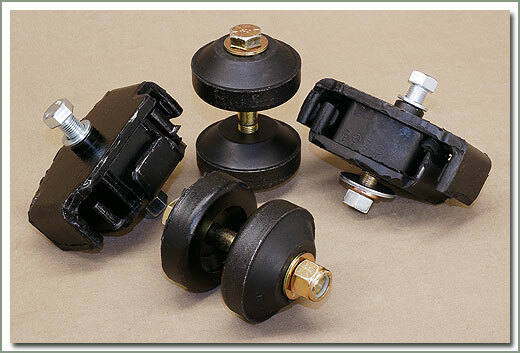 We offer a complete Motor Mount Kit with mounts and hardware (#040-05-KIT). We offer a separate kit with mounts only (#040-05A-KIT), and a kit with hardware only (#040-05AB-KIT). Since both long rear motor mount bolts have been discontinued by Toyota, SOR designed a kit using a rear long bolt and a Nyloc nut. Unlike the OEM long bolt/castle nut combo, Specter's combination can continue to be tightened as the mount compresses with age. Both mount kits feature the updated "clam shell" style front mounts that interlock when the rubber fails keeping the engine from changing position in the engine bay. The complete Mount Kit includes these updated front "clam shell" style mounts, plus the rear mounts and the Bolt Kit. The "Mount only" Kit includes the updated front mounts and the 4 rear mounts with no hardware. 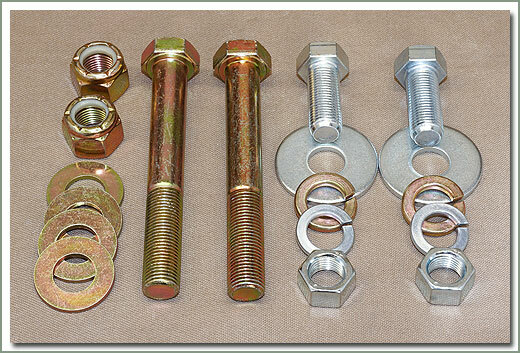 The Bolt Kit includes the front mount bolts and nuts, rear mount bolts and nuts, and the appropriate washers with no mounts. Fits 1958-7/80 FJ40/FJ55 - This kit includes qty 2 Front heavy duty updated style and 4 rear engine motor mounts plus all the hardware to install. Fits 1958-6/76 FJ40/45 - Kit includes qty 2 front updated heavy duty motor mounts & qty 4 rear motor mounts - Does NOT include hardware! 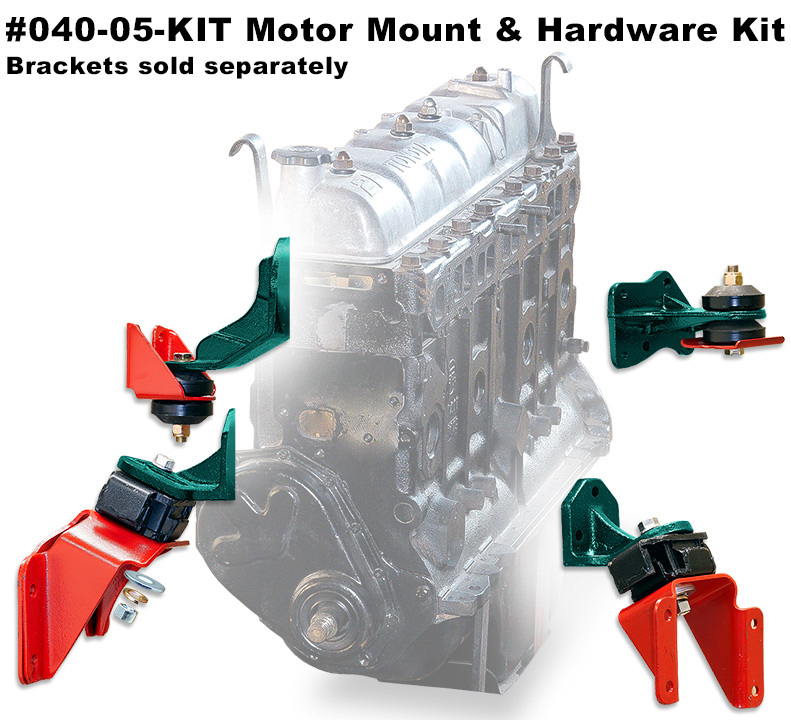 SOR offers three Motor Mount component kits. 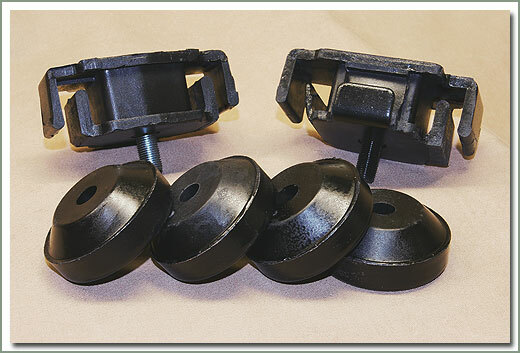 We offer a complete Motor Mount Kit with mounts and hardware (#040-05-KIT). We offer a separate kit with mounts only (#040-05A-KIT), and a kit with hardware only (#040-05AB-KIT). Since both long rear motor mount bolts have been discontinued by Toyota, SOR designed a kit with a rear long bolt using a Nyloc nut. Unlike the OEM long bolt/castle nut combo, Specter's combination can continue to be tightened as the mount compresses with age. Both mount kits feature the updated "clam shell" style front mounts that interlock when the rubber fails keeping the engine from changing position in the engine bay. The complete Mount Kit includes these updated front "clam shell" style mounts, plus the rear mounts and the Bolt Kit. The "Mount only" Kit includes the updated front mounts and the 4 rear mounts with no hardware. The "Bolt only" Kit includes the front mount bolts and nuts, rear mount bolts and nuts, and the appropriate washers with no mounts.